30% of all Bangladeshis and 56% of Bangladeshi children under the age of 5 suffer from moderate to severe malnutrition. The country has some of the highest child and maternal malnutrition rates according to the UNICEF State of the World's Children Report 2012. While Bangladesh produces sufficient rice to nourish its people, diets often lack vital nutrients such as vitamins and minerals. As a response to this illness, two inspiring men decided to join forces and complimentary expertise. Franck Riboud, CEO of Group Danone, and Muhammad Yunus, founder of Grameen Bank and later winner of the 2006 Nobel Peace Prize, decided to create a joint venture called “Grameen Danone Foods”. The project was new and challenging: create a yogurt factory in Bangladesh whose mission was to contribute to local development. Created in 2006 as a social business, Grameen Danone Foods’ primary aim is to have a positive social impact; its pursuit of profitability is based solely on criteria such as improving public health through nutrition, creating jobs, reducing poverty and protecting the environment. The product, “Shokti Doi” (“that which builds strength” in Bengali), is a yogurt that is fortified with nutrients (including vitamin A, iron, zinc and iodine) to make up for the dietary deficiencies of the local populations. The price is affordable for the poorest individuals (7BDT (= 0.07 EUR)). Grameen Danone Foods affects people's lives not only by improving their health. Benefits exist along the whole value chain. The milk for the yoghurt is purchased from micro-farmers. The production is designed in such a way as to give as many people as possible a job. Sales ladies, the “ Shokti ladies”, distribute the yoghurt door-to-door in the villages and receive a 20% margin. In total, Grameen Danone Foods is responsible for the support of about 1,400 jobs (direct and indirect) within a 30km radius around the plant. The dairy farmer, the rural sailing lady, the factory employee….I wanted to understand how the project has impacted their lives. Akabor and Alfa are dairy micro-farmers. They have 3 children and live in the village of Nobadori Shariakandi, Bogra’s district. Their house isn’t very big, but they have today 5 healthy cows and a lot of hope to improve their livelihood. Akabor is a hard worker and I can sense his determination. 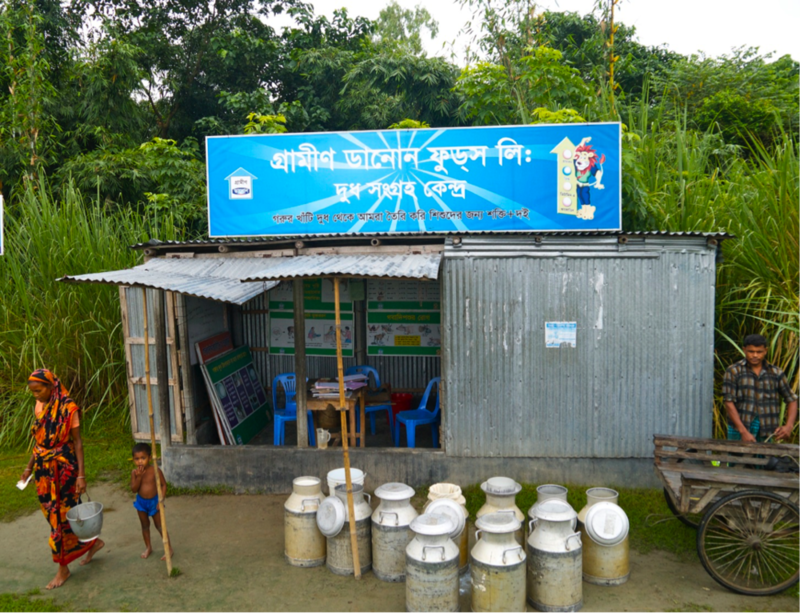 They have been able to sell their milk to Grameen Danone since 2009. They could beneficiate from the cow vaccination’s program and farming trainings. They are happy and grateful. The milk collect point is very close to their house, and they can sell today more than 20 litres a day at a good price. Selling the milk to a collect point that is 5 minutes walk from the house is also a major change. Not only does it save time but it also enables women to sell the milk while their husband are working in the fields (for either cultural or distance issues, most of the women here can not go to the market). Alfa is glad to be able to sell the milk herself and Akbor saves time to take care of his cows. The Micro-credit at the Grameen bank has also been a great help; it enabled Akabor to bye more cows. Thanks to his regular sales to Grameen Danone, his income has increased, improving his family conditions. His dream? “I would like to have more land and become a bigger farmer so I can sell more milk to Danone”. For his wife Alfa, the dream is to provide better education for their children and have a “real house, with rigid walls, like this one” she told me pointing at the neighbours (rather simple) house. Life isn’t always easy… but it is getting better. The impact of GDFL’s activity on these micro-farmers lives is more than positive. It brought them security, a better income and most importantly, hope to improve their livelihood. Another farmer, Emdadul, shared with me his enthusiasm. “ I have been selling my milk to Grameen Danone every day since 2009! My income has increased, I am very happy and also very proud: thanks to GDFL the area is now famous for its milk!”. His last comment made me smile. We could not really assert that the area is now internationally “famous“ for milk! However, it shows one thing: the establishment of GDFL’s factory and business has not only enable him to sell his milk in better conditions; Emdadul also feels that people are now interested in them and that they care. It valorises his work, his area and brings him pride. Tahera is one of the 82 “Shokti ladies” of the district, selling door to door the yoghurt in her village. In fact, Tahera is one of the best Shokti sellers. She has been working for GDFL for 4,5 years now, and sales an average of 130 cups of Shokti everyday (two times more than most of the average sellers!). She is very active, as a seller but also as a woman in her community. She talks a lot about nutrition to the mothers of the village to convince them of the benefits of yogurt and nutrients for their children’s health. She herself tried to give as regularly as possible the Shokti + to her son when he was younger, “to make him strong”. As many of these women, it is her first work and she feels very grateful for it. She needed to earn some money, as her husband neglects her and her son, leaving them with no financial support. Her son is now 14 years old, he goes to school and Tahera is working hard to provide him the best life she can. You can see in her eyes her sufferance but yet the strong determination and strength to fight (and she is actually the one you came to see Grameen Danone to ask to work for them after having met a “shokti lady” in her village). Her struggle made her tough and strong-minded. It is in fact not easy to make her smile when interacting with here; she is very focused on her work, selling the yogurt, counting the money, going to on house after another...no time to loose. But when I ask her what has Grameen Danone brought to her, she responds with words of deep gratitude. “Thanks to this work, I can earn some money and give my son an education. I learned a lot about nutrition, but also on selling and dealing with money. I feel more confident and strong. I am proud to be working for GDFL and am very thankful I had this opportunity”. Her dream? A good education for her son; in fact she would like her son to work for Danone, and have a good life. I admire Tahera’s strength and courage. Being a woman in Bangladesh is difficult, and being alone to raise a child in these remote areas makes it even harder. It is an everyday struggle and that just shouldn’t be. Offering them a job is a chance for them to survive, to grow strong, to even hope for a better future for their children. Grameen Danone brought faith to Tahera : an income to live, a role in her community and a dream to hold on to. I see here staring at the Shokti+ packaging and its famous little Lion: he is indeed an amazing symbol of strength, for the children to grow, but I like to think also for these women to fight. Grameen Danone’s social business impacts the lives of thousands of people, from children having a better nutrition to all the GDFL hard workers that are today proud and thankful to be part of the adventure. Shokti+ makes them strong, through nutrition for the youngest, and through empowerment for the eldest. Being a social business makes it of course very challenging. Reaching the long-awaited "break-even point” takes time and adjustments. To up-scale the project demands patience. Yet, I truly believe it is worth the effort, the time and the questionings. The social impact is undeniable; the objective of building new social and sustainable models is too crucial. These testimonials give hope, and the children’s smile brings strength to keep on trying.